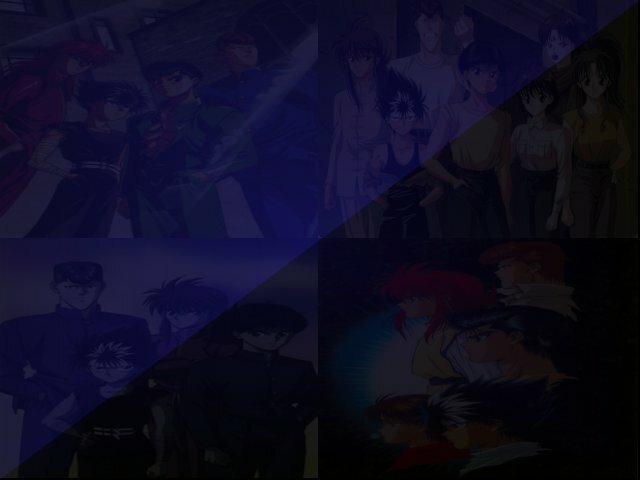 Yusuke, Kuwabara, Kurama, Hiei and a woman in a mask are riding in a special ship that will take them to the battle isle of the Ankoku Bujutsukai, a tournament of the demons. They are to be the special competitors of the said bout, a tournament where demons rule. Yusuke is sleeping while the others look by the sea and wondering what the tournament will be.. Just then the captain of the ship spurts out that their will be a special battle that will happen in the said ship and the survivors will be the only ones who can enter the isle. Suddenly part of the ship turns into a battle ring... and Yusuke's gang is forced to have a match they aren't prepared for. They argue on who will fight the demons that are challenging them, but just then the woman in the mask steps in and decides she would be the first to face their opponents..
Back at the spirit world Koenma finds out the tournament of the demons Yusuke is getting involved in and is getting furious on why Botan hasn't returned yet.. and then we see the reason. Botan is being rashly interrogated by both Keiko and Shizuru, asking where the hell Yusuke and Kuwabara are.. as we see a drunk Atsuko snoring in the background. Botan is forced to tell them the truth and the thing about the Ankoku Bujutsukai that Koenma informed her.. makes Keiko faint from shock. Seems like things are getting calm but just then Keiko pleads for Botan to take her to them.. the place of the tournament.. and things just got worse than ever. Then we have a glimpse of Sakyou, who was the proprietor of this whole Ankoku Bujutsukai all this time. He also made the tournament into a gambling game just like Tarukane did.. Seems like the special ship Yusuke and the rest was in was a mere setup to test their skills, courtesy of Sakyou by the request of who else.. Toguro. Kuwabara and the gang arrive at the isle and, being the special competitors of the tournament, they get a world class suite on a five-star hotel where they will spend their countless nights during the Ankoku Bujutsukai. They relax a bit, and Yusuke is still sound asleep. But just then they are greeted by Rinku, one of the members of the Rokuyukai team (he also stole a cup of coffee) and by Zeru, the leader of the said team. It looks like they are the group they will face in their inagural battle the next day at the start of the competition... as the night ends.